Heat oven to 350°F. Spray 13x9-inch (3-quart) glass baking dish with cooking spray. Season chicken with 1/2 teaspoon of the salt and 1/4 teaspoon of the pepper. Meanwhile, in 12-inch nonstick skillet, heat 1 tablespoon of the oil over medium-high heat. Add chicken; cook 6 to 8 minutes, stirring occasionally, until chicken is no longer pink in center. Use slotted spoon to remove chicken from skillet. Add 2 tablespoons oil to skillet; add onions, bell peppers and garlic. Cook 8 to 10 minutes, stirring occasionally, until vegetables are tender. Stir in paprika and flour; cook and stir 1 minute. Add tomato paste; cook and stir 1 minute. Stir in chicken broth, remaining 3/4 teaspoon salt and remaining 1/4 teaspoon pepper; heat to boiling. Reduce heat to low; simmer 3 to 5 minutes or until thickened. Remove from heat; stir in cream cheese and sour cream. Return noodles to pot they were cooked in; add cooked chicken and onion-bell pepper mixture. Stir to combine. Pour into baking dish. Cover with foil. Bake 20 to 25 minutes or until heated through. Meanwhile, in 8-inch skillet, heat remaining 1 tablespoon oil over medium heat. Add bread crumbs; stir to coat. Cook and stir 3 to 4 minutes or until lightly browned. Transfer to small bowl. Stir in parsley. Sprinkle bread crumb mixture over baked casserole, and serve. 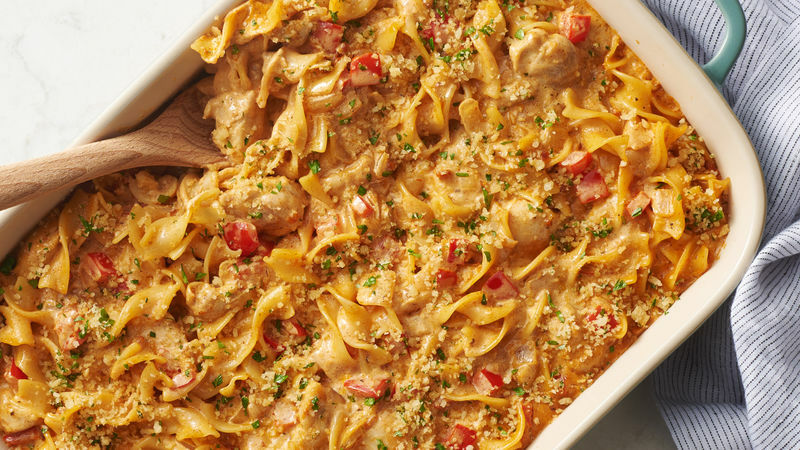 To make this hearty casserole even creamier, top with dollops of sour cream as a garnish. You will often see Hungarian paprika labeled as either sweet or hot. The sweet paprika isn’t sweet, but does have an earthy, fruity flavor. Hot paprika can add quite a bit of heat to a dish, much like cayenne.